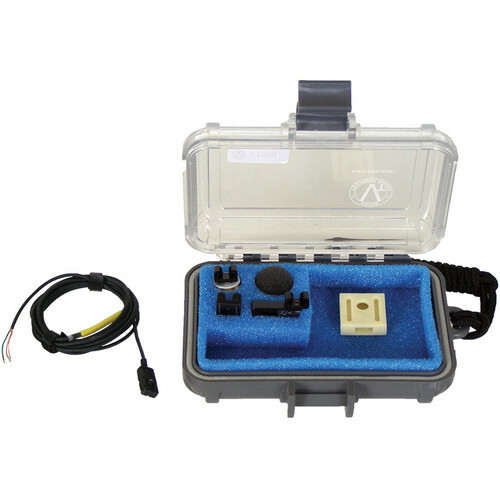 The black Voice Technologies VT506WATER Waterproof Miniature Omni Lavalier Microphone with Unterminated (3-Wire Pigtail) Connector is a waterproof version (IPX-7 certificated) of the VT506 lavalier microphone and comes in an Otter Box case with a foam insert, an alligator microphone clip, a dracula microphone clip, a foam windscreen, a tie tac clip, and a rubber body microphone mount. Due to a special injection-molded treatment, the microphone can even be temporarily situated completely under water, without damage. This makes it flexible for use in live broadcast and even at sports events. The microphone is rugged, highly shock-resistant, and has a flexible cable which provides excellent isolation from handling noise. Box Dimensions (LxWxH) 5.0 x 3.5 x 1.6"